Two-pronged evaluation research to determine perceptions of and needs for an innovative entrepreneurship project aimed at six to fifteen year olds. As well as the monitoring and evaluation of a pilot phase implementation in Cape Town and Johannesburg in 2004/5. Impact Consulting conducted an impact assessment of the CCDI’s four key focus areas, evaluating the outcomes of their key programmes on Western Cape crafters and the craft sector, including the development of entrepreneurs in 2007. Impact Consulting conducted an impact assessment of the Community Chest’s capacity building training programme focused on CBOs, funded by the Charles Stewart Mott Foundation in 2006.
Review of the work conducted by the Contact Trust, an organisation that aims to facilitate the process of participatory democracy and publication of an online resource in 2006. 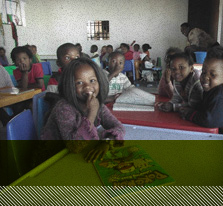 Impact Consulting has worked with the DG Murray Trust in the Early Childhood Development sector, having conducted a needs assessment for an ECD training and resource organisation in Limpopo in 2005. 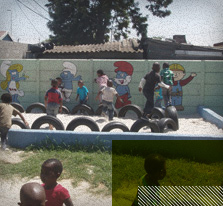 Impact Consulting conducted a qualitative outcomes assessment in four schools in the Greater Cape Town area in 2010/11. Evaluation of the Botswana Centre for Human Rights (Ditshwanelo) and the legal component of the Botswana Network on Ethics, Law and HIV/AIDS (BONELA) which have received funding from the Embassy since 2007. Conducted a situational assessment of the six communities in which EMEP implemented its Continued Development Project in 2009. Conducted an outcomes-based evaluation of the "11 for Health" pilot programme in Khayelitsha in 2009. This was a joint project between FIFA’s Medical Research Arm (F-MARC) and Grassroot Soccer. The study evaluated health and HIV/AIDS knowledge and attitude changes among Grade 7 participants who were given health messages through the game of soccer. Conducted an evaluation of the Skillz Core Intervention curriculum with the aim of informing the revision of this curriculum in 2009. Community Education Trust: Conducted an impact assessment and outcomes evaluation of the School and Health Outreach Programmes in 2009. Levi Strauss Foundation (LSF) and the Community Chest Western Cape: Evaluated a pilot partnership where the latter was commissioned to become a fiscal agent of LSF funds in a community in the Western Cape with a strong focus on HIV/AIDS projects in 2006. Conducted a three-year evaluation project. The project includes a long-term impact assessment of a housing project using a quasi-experimental design looking at how quality of life indicators such as health and social wellbeing are affected by individuals living in houses from 2008 to 2011. 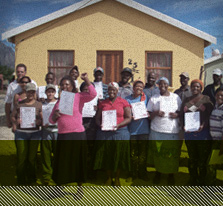 Conducted a community development audit of MHI’s work in the Western Cape in 2008. The research was conducted using an adaptation of the asset-based community development (ABCD) model. Evaluation of SCORE and an evaluation of the implementation, achievement of objectives and outcomes in various communities in 2006. The study also investigated the partnership between SCORE and a Namibian implementing partner, as well as the relationship with the Namibian Ministry of Sports, who had a key stake in the volunteers who were being trained by the partnership. Currently conducting monitoring and evaluation of five grants that are being provided from 2010 to 2012 by the Emthunzini Broad-based Black Economic Empowerment Community Trust. Conducted an evaluation of the tuXlabs Open Source Technology Project that was implemented in the Western Cape by the Shuttleworth Foundation and Inkululeko Technologies in 2008. Evaluation of the South African Education and Environment Project (SAEP)’s Maths, Science and Technology interventions in township schools in the Western Cape in 2005. Conducted an evaluation of four projects in 2008 in order to assess processes, outputs and implementation methods of each project in light of its effectiveness, quality and strength to deliver and sustain the planned outcomes. Evaluation of SCORE’s Ubuntu Training Institute that aims to promote youth leadership and community development through developing sport in disadvantaged communities in 2005. Evaluated IJR’s Community Healing Project in order to assess the effectiveness and outcomes of the project in 2010. Outcomes assessment for an arts project for Coordination of the outcomes-based evaluation of Inyathelo: The South African Institute for Advancement’s capacity-building peer learning programme for black women leaders of non-profit organisations, in collaboration with Dr Donna Podems and Professor Lehn Benjamin. Conducted an impact assessment of SAT’s HIV/AIDS resources and publications, aimed at non-profit organisations working within Mozambique, Malawi, Tanzania, Zambia and Zimbabwe in 2006/7. In 2008, conducted an evaluation of two in-school entrepreneurship education projects: the South African Institute for Entrepreneurship (SAIE) and the Enterprise with Education Trust (EWET), assessing which model contributed to better outcomes and identifying the strengths and weaknesses of each model. Efficiency and Effectiveness Evaluation of service delivery of the Western Cape Department of Social Development’s district offices, facilities and service points. Conducted an evaluation of WC-NACOSA as a funding conduit for the National Development Agency’s (NDA) Urban Renewal Project in Mitchells Plain and Khayelitsha (a cluster of nine organisations) in 2006. Conducted evaluating the impact of information and communication technology (ICT) provided by the Zisukhanyo Schools Project on the literacy and numeracy levels of learners in three schools in Mitchell’s Plain in 2009-2011. Designed an integrated monitoring and evaluation system that includes strategy, impact planning and logic model design, planning for data collection and analysis, the development of monitoring and reporting tools and templates and the implementation of the framework through the whole organisation. Impact Consulting conducted a study to identify technologies employed in the South African tourism market as part of a larger project which will investigate ways of using tourism for social and economic development in 2005. Prospect research and a report on individual giving in 2005. Impact Consulting profiled the District Six Museum for the online South African Cultural Observatory (www.culturalobservatory.org.za) and conducted an investigation of the current income generation and cultural products at the Museum and analysed stakeholder interviews to determine potential future products in 2004. Capture and analysis of over 100 000 survey questionnaires in 2007. The survey investigated the public’s level of awareness of Integrated Development Plans and local government. Social Cohesion and Integration Unit, commissioned by the President of South Africa, Thabo Mbeki: Research report on the state of social cohesion in South Africa post-democracy by the Non-profit sector in South Africa (formal registered organisations and informal community organisations) in 2004. Research report on race and gender discrimination in South Africa and how this affects social cohesion in the country in 2004. The South African Institute for Advancement: Development of a prospect database for the production of a public service announcement for the Centre for Early Childhood Development (CECD) in 2006 which was awarded a place as a semi-finalist and aired on television. Production of a report on the outcomes of an international conference held in Johannesburg for sport-for-development organisations in July 2010. Conducted a research snapshot on housing and HIV in the Wallacedene community, near Cape Town in 2009. Research on prospective donors in 2007. Impact Consulting assisted Mike van Graan with a research report for the Western Cape Department of Economic Affairs and Tourism’s Microeconomic Development Strategy Sector, to inform policy recommendations about the creative industries in the Western Cape around this sector. The final research report submitted by Mike van Graan was two-pronged, including a primary research and desk-based baseline study of the creative industries in the Western Cape; and a report on policy recommendations based on the baseline information. Training the Development and Fundraising Research team in the Advancement office in 2009/10.